Heads up folks – we’ve just started a brand new Van Lifers and Weekend Warriors group for all of your Van Life needs, wants and cravings! Join today and get a piece of the action. Take a minute to have a look at the photo above before continuing…It’s ok, take your time. This VW California Camper is a work of art, and it’s a perfect example of a modern build that takes you back in time as soon as you open the side door. 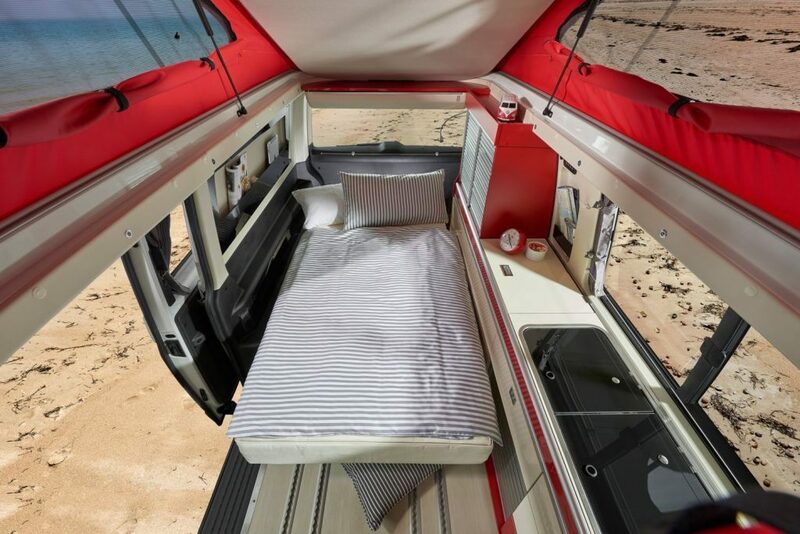 Just like the Wild Camp Citroen Camper Van, this newest creation from Westfalia allows vintage camper lovers a chance to own a piece of their past, and younger digital nomad millennial types to see what the soul of van life really looks like. As much as Lord Of The Rings is really a documentary (yes…it’s real). Meet the Kepler Sixty, Westfalia’s answer to the rise of luxury motorhomes that are being churned out left right and centre. While your Knauss Boxdrive CUV and Mercedes Sprinter Conversions might be swish enough to take Barbara Ann out to see a movie, she knows that all of the other California Girls are queuing up for a ride in this VW California Camper (I’ve exhausted my Beach Boys knowledge now – time to move on). The Kepler Sixty VW California Camper uses a VW T6 as it’s base model and catches everyone’s eye with its classic two-tone paint job. It’s an excellent compromise for those that want comfort, style, and the mod cons that make living in a van full time that bit easier. 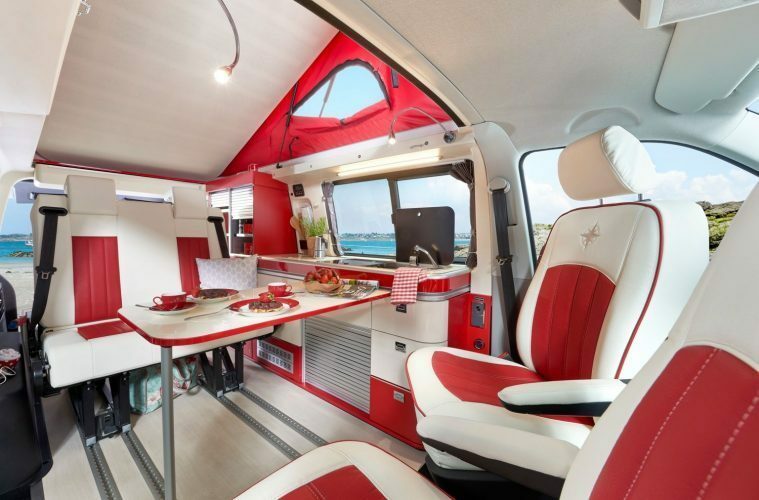 This VW California Camper spares no expense in the more delicate details; from the swivel captains-chair style front seats to the dining plates and cups, everything revolves around that retro two-tone theme. 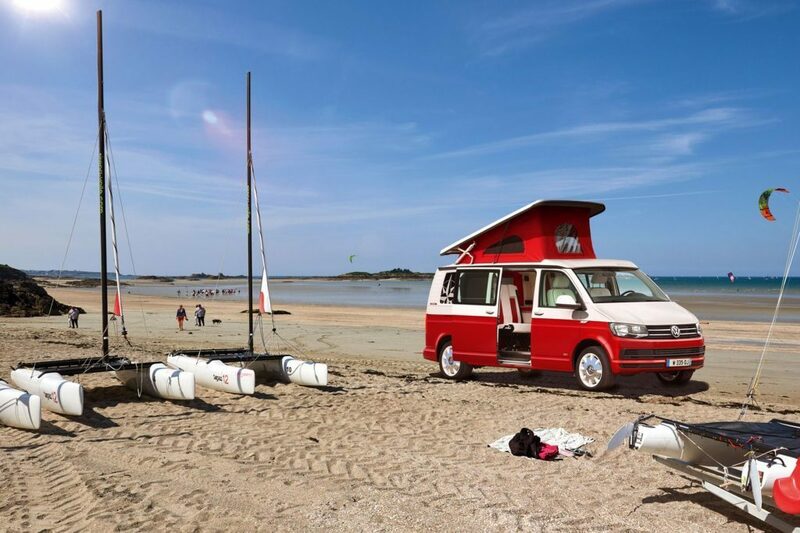 It makes us think of ice creams and long walks on the beach; a perfect summer getaway vehicle and our top choice for travelling in a van in 2019! 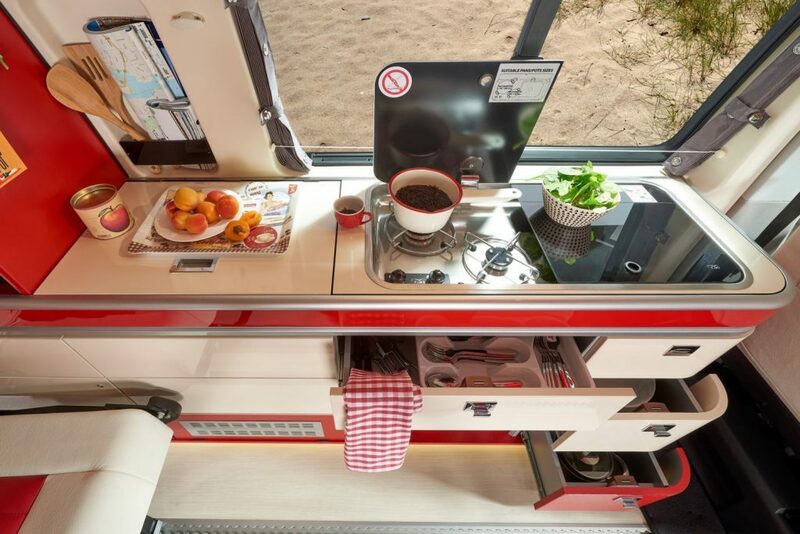 As always, Westfalia has made the most of the space inside this T6, creating a comfortable living area and a unique looking kitchenette that holds all of the top cooking accessories that you could possibly need while living the van life. The flat countertop features a pull-up stove and sink compartment, as well as holding a spacious fridge for all of your ice-cold, refreshing beverages. 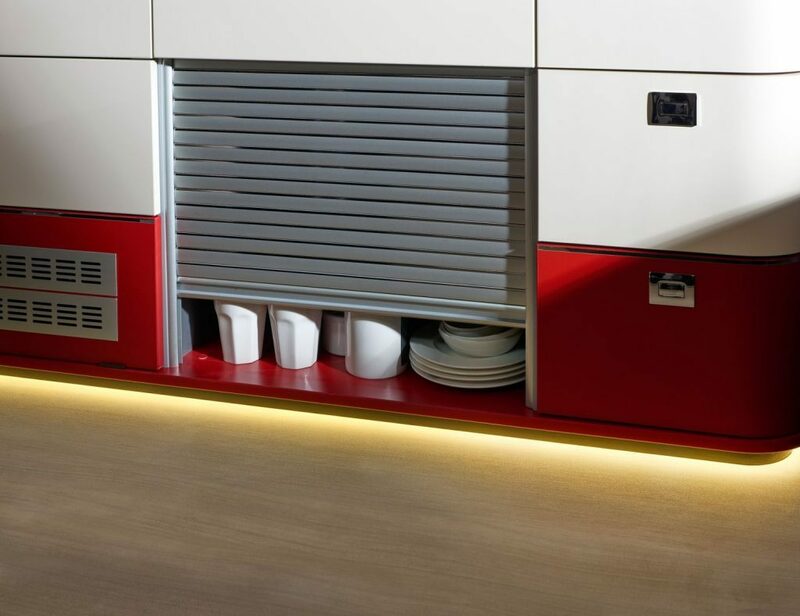 The Kepler also has lots of smart storage solutions, including under counter shelves, push-release cupboards, and a nice little pocket for holding utensils and maps. The pullout table makes a great place for eating or playing games, and the adjustable LED lighting can be angled to your own specification, making nighttime reading a doddle. 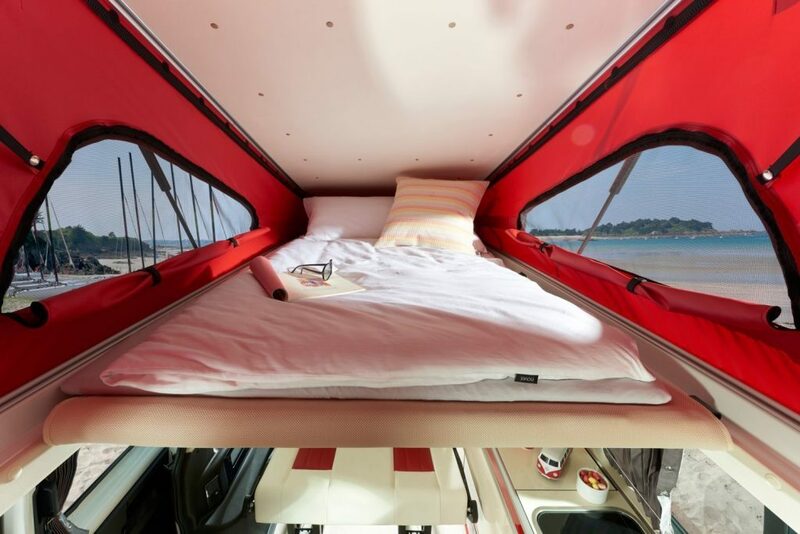 Perhaps the most classic feature of this VW California Camper is the iconic rock n roll bed. The sophisticated leather seats in the back fold down to make a comfy looking bed that could fit two adults (as long as those adults don’t mind getting cosy, so we’re probably looking at a couple, or maybe super-creepy-close siblings). Hang on; make that the second most classic feature, because this VW California Camper has what all tiny homes need – a pop top. That’s right; this pop top camper has the added advantage of creating extra headroom for all of you tall folks out there. Not only that, but there’s an extra bed that you can slide out for the kids or another passenger that you don’t want snoring in your ear all night. The pop top has additional windows to help ventilate the camper and bring in more light too. 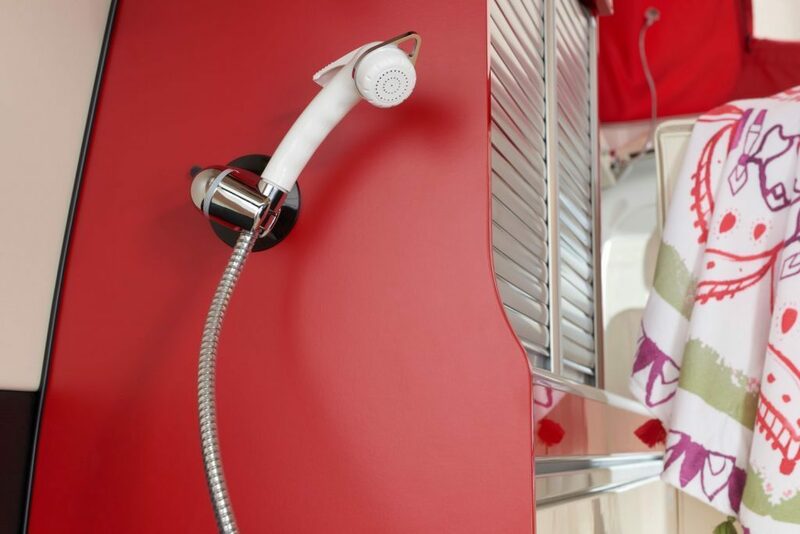 Now if only it had an outdoor shower too; that would give the Kepler Sixty the whole package. It Has An Outdoor Shower…Doesn’t It. You read my mind! 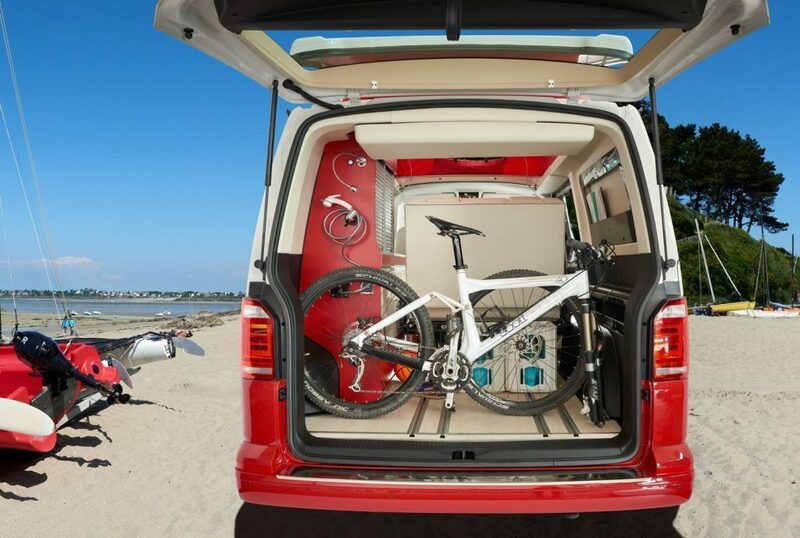 Yes, this VW California Camper comes with an outdoor shower in the boot, and also has enough room to store your bike for some city sightseeing trips. The rear door opens fully out, giving you easy access to the boot, and there’s still room left over in the back for your van life essentials and campervan gifts that you’ve bought for your friends while out on your adventures too! If you haven’t picked up that I like this camper by now, then this last section should cover all bases. The Kepler Sixty is like one of those strawberry swirl sweets you get from old fashioned sweet shops; no matter how old you are when you buy a packet, you can’t help but feel like an excited kid. Westfalia has managed to bottle that excitement and make it into a retro-looking camper that won’t fail you on long journeys and won’t cost the earth in repairs every month. I know that’s part of the fun for some people, but for those that just want a classy looking ride then this VW California Camper ticks every box, including the price. The Kepler Sixty will cost you €61’000 euros, which isn’t bad at all considering the VW badge that will be on the front of your camper as you drive it off the forecourt. If you’re a weekend warrior or a full-time travel buff, this VW California Camper is perfect from the campground to the forest. All you need to decide now is who you’re going to take with you, and who’s getting the top bunk! These vanlife tips should help to prepare you for your new nomadic lifestyle. Check out these vanlife blogs that you should be following for inspiration! Looking for van life insurance? SafetyWingvhas got you covered.